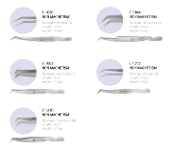 A new collection of Eyelash Extensions tweezers for Russian Volume application. Made of high quality professional grade stainless steel for precise precision and grasp. Take total control over ultra-thin lashes. Maximum grip control with minimum force!